The musical entity of Wicked Aura is 15 years of age this year and in a manner of speaking, on the cusp of its hyperactive, mischievous, inquisitive, experimental and rebellious adolescent years. The clan reckons its a good time to put on your red shoes and dance the blues. And of course, celebrate all things Wicked and loud. Come the 7th of July, noise, rhythm, melody and words will collide to produce a sensation that prose or pictures can never quite capture. All you gotta do is come experience it live!!! Happy new year! Our first event of the year features two of Asia's most respected luminaries of jazz, Don Gomes and Aya Sekine, come together to perform a piano duo concert on Fazioli. AYA FEST (AF) is a 2-day festival organised by me, a Singapore based Japanese jazz pianist, also I direct my little company Bon Goût Music (BGM), through which I offer music venue/event/tour programming and consultations, as well as the curation of acts to stir things up in Singapore. I consider myself as an activist for creative environment. This is a celebration of my venture of connecting Singapore and Japan’s independent music scenes, with the aim of developing larger and stronger community across the border, which I believe can make things more interesting, and create opportunities for both parties. Experience impeccable techniques, melodic lyricism and haunting sense of tenderness by YUHAN-SU live at Club L'Opera on Saturday, 5th November at 7pm. Welcome to the finest, safest and most comfortable listening room in Singapore. Starting month of September, we are an official designated live music programmer/manager for Club L'Opera at Boat Quay. We have been loving this venue for years since their opening in 2011, but as many of you might've totally missed out, it went through some detours, but now back and ready to rebrand itself partnering with us. Owner and founder Mr. Katsumi Mizutani making a opening speech with Bon Goût Music director/programmer Aya Sekine. Bon Goût Music has done strategic analysis and projection, and our special squad is ready to give you joy of concentrating on detail (for artist) and listening (for audience). 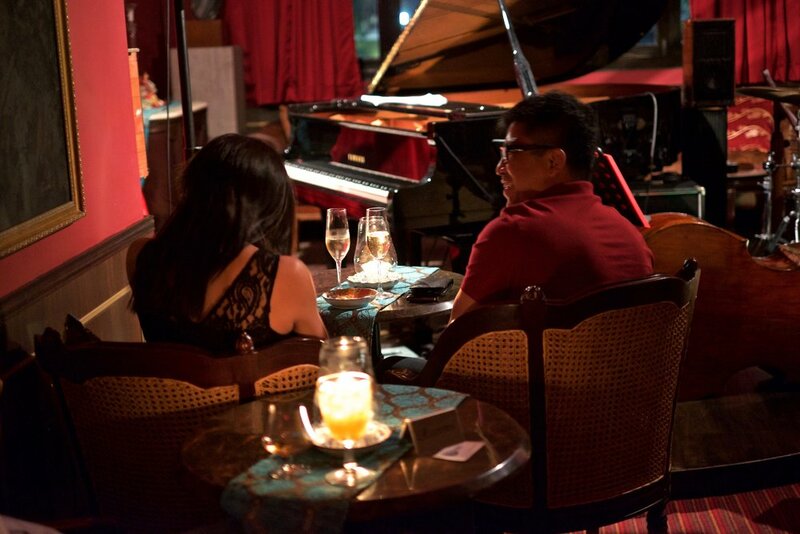 Please be patient, but caution ahead for some consistent quality acoustic performances with owner Mr.Mizutani's main love in Jazz and classical music, with finely tuned Yamaha C2 grand piano. Extremely limited seating of 20, and 20 standing. Bon Goût Music is really excited to have programmed a very rare combination of 3 powerful music figures in Singapore's music scene, and we are back at The Music Parlour! All three of them equally, or competitively proficient in their individual interpretation of soul and jazz. It is going to be hysterical. We are hearing from each and one of them about this new trio, and we can feel it will be a very special night. All ticket comes with 1 free Jameson Whisky drink, and while stock last - It's a great deal for whisky lovers! Featuring one of the most prominent improvisor around this part of the world, Tim O'Dwyer on sax paired with ever swinging drummer Darryl Ervin plus up and coming young improvisor Joe Lee on the guitar. This particular instalment of SSMS will take place at another hide-out, The Music Salon on the quaint street of Niven Road. Prepare yourself for something different, something extremely organic on the 13th Friday. A bottle of beer on us.